Coal is an abundant resource in the world...It is imperative that we figure out a way to use coal as cleanly as possible. " "Rapid commercial development and deployment of clean coal technologies, particularly carbon capture and storage, will help position the United States as a leader in the global clean energy race." With coal likely to remain one of the nation's lowest-cost electric power sources for the foreseeable future, the United States has pledged a new commitment to even more advanced clean coal technologies. But coal is not a perfect fuel. Trapped inside coal are traces of impurities like sulfur and nitrogen. When coal burns, these impurities are released into the air. While floating in the air, these substances can combine with water vapor (for example, in clouds) and form droplets that fall to earth as weak forms of sulfuric and nitric acid - scientists call it "acid rain." There are also tiny specks of minerals - including common dirt - mixed in coal. These tiny particles don't burn and make up the ash left behind in a coal combustor. Some of the tiny particles also get caught up in the swirling combustion gases and, along with water vapor, form the smoke that comes out of a coal plant's smokestack. Some of these particles are so small that 30 of them laid side-by-side would barely equal the width of a human hair! Also, coal like all fossil fuels is formed out of carbon. All living things - even people - are made up of carbon. (Remember - coal started out as living plants.) But when coal burns, its carbon combines with oxygen in the air and forms carbon dioxide. Carbon dioxide is a colorless, odorless gas, but in the atmosphere, it is one of several gases that can trap the earth's heat. Many scientists believe this is causing the earth's temperature to rise, and this warming could be altering the earth's climate (read more about the "greenhouse effect"). Sounds like coal is a dirty fuel to burn. Many years ago, it was. But things have changed. Especially in the last 20 years, scientists have developed ways to capture the pollutants trapped in coal before the impurities can escape into the atmosphere. Today, we have technology that can filter out 99 percent of the tiny particles and remove more than 95 percent of the acid rain pollutants in coal. We also have new technologies that cut back on the release of carbon dioxide by burning coal more efficiently. Many of these technologies belong to a family of energy systems called "clean coal technologies." Since the mid-1980s, the U.S. Government has invested more than $3 billion in developing and testing these processes in power plants and factories around the country. Private companies and State governments have been part of this program. In fact, they have contributed more than several billion dollars to these projects. The Clean Coal Technology Program began in 1985 when the United States and Canada decided that something had to be done about the "acid rain" that was believed to be damaging rivers, lakes, forests, and buildings in both countries. Since many of the pollutants that formed "acid rain" were coming from big coal-burning power plants in the United States, the U.S. Government took the lead in finding a solution. One of the steps taken by the U.S. Department of Energy was to create a partnership program between the Government, several States, and private companies to test new methods developed by scientists to make coal burning much cleaner. This became the "Clean Coal Technology Program." How do you make coal cleaner? Actually there are several ways. Take sulfur, for example. Sulfur is a yellowish substance that exists in tiny amounts in coal. In some coals found in Ohio, Pennsylvania, West Virginia and other eastern states, sulfur makes up from 3 to 10 percent of the weight of coal. For some coals found in Wyoming, Montana and other western states (as well as some places in the East), the sulfur can be only 1/100ths (or less than 1 percent) of the weight of the coal. Still, it is important that most of this sulfur be removed before it goes up a power plant's smokestack. One way is to clean the coal before it arrives at the power plant. One of the ways this is done is by simply crushing the coal into small chunks and washing it. Some of the sulfur that exists in tiny specks in coal (called "pyritic sulfur " because it is combined with iron to form iron pyrite, otherwise known as "fool's gold) can be washed out of the coal in this manner. Typically, in one washing process, the coal chunks are fed into a large water-filled tank. The coal floats to the surface while the sulfur impurities sink. There are facilities around the country called "coal preparation plants" that clean coal this way. Not all of coal's sulfur can be removed like this, however. Some of the sulfur in coal is actually chemically connected to coal's carbon molecules instead of existing as separate particles. This type of sulfur is called "organic sulfur," and washing won't remove it. Several process have been tested to mix the coal with chemicals that break the sulfur away from the coal molecules, but most of these processes have proven too expensive. Scientists are still working to reduce the cost of these chemical cleaning processes. Most modern power plants — and all plants built after 1978 — are required to have special devices installed that clean the sulfur from the coal's combustion gases before the gases go up the smokestack. The technical name for these devices is "flue gas desulfurization units," but most people just call them "scrubbers" — because they "scrub" the sulfur out of the smoke released by coal-burning boilers. Most scrubbers rely on a very common substance found in nature called "limestone." We literally have mountains of limestone throughout this country. When crushed and processed, limestone can be made into a white powder. Limestone can be made to absorb sulfur gases under the right conditions — much like a sponge absorbs water. In most scrubbers, limestone (or another similar material called lime) is mixed with water and sprayed into the coal combustion gases (called "flue gases"). The limestone captures the sulfur and "pulls" it out of the gases. The limestone and sulfur combine with each other to form either a wet paste (it looks like toothpaste! ), or in some newer scrubbers, a dry powder. In either case, the sulfur is trapped and prevented from escaping into the air. Air is mostly nitrogen molecules (green in the above diagram) and oxygen molecules (purple). When heated hot enough (around 3000 degrees F), the molecules break apart and oxygen atoms link with the nitrogen atoms to form NOx, an air pollutant. Nitrogen is the most common part of the air we breathe. In fact, about 80% of the air is nitrogen. Normally, nitrogen atoms float around joined to each other like chemical couples. But when air is heated - in a coal boiler's flame, for example - these nitrogen atoms break apart and join with oxygen. This forms "nitrogen oxides" - or, as it is sometimes called, "NOx" (rhymes with "socks"). NOx can also be formed from the atoms of nitrogen that are trapped inside coal. In the air, NOx is a pollutant. It can cause smog, the brown haze you sometimes see around big cities. It is also one of the pollutants that forms "acid rain." And it can help form something called "groundlevel ozone," another type of pollutant that can make the air dingy. NOx can be produced by any fuel that burns hot enough. Automobiles, for example, produce NOx when they burn gasoline. But a lot of NOx comes from coal-burning power plants, so the Clean Coal Technology Program developed new ways to reduce this pollutant. One of the best ways to reduce NOx is to prevent it from forming in the first place. Scientists have found ways to burn coal (and other fuels) in burners where there is more fuel than air in the hottest combustion chambers. Under these conditions, most of the oxygen in air combines with the fuel, rather than with the nitrogen. The burning mixture is then sent into a second combustion chamber where a similar process is repeated until all the fuel is burned. This concept is called "staged combustion" because coal is burned in stages. A new family of coal burners called "low-NOx burners" has been developed using this way of burning coal. These burners can reduce the amount of NOx released into the air by more than half. Today, because of research and the Clean Coal Technology Program, approximately 75 percent of all the large coal-burning boilers in the United States will be using these types of burners. A "Bed" for Burning Coal? It was a wet, chilly day in Washington DC in 1979 when a few scientists and engineers joined with government and college officials on the campus of Georgetown University to celebrate the completion of one of the world's most advanced coal combustors. It was a small coal burner by today's standards, but large enough to provide heat and steam for much of the university campus. But the new boiler built beside the campus tennis courts was unlike most other boilers in the world. In a fluidized bed boiler, upward blowing jets of air suspend burning coal, allowing it to mix with limestone that absorbs sulfur pollutants. It was called a "fluidized bed boiler." In a typical coal boiler, coal would be crushed into very fine particles, blown into the boiler, and ignited to form a long, lazy flame. Or in other types of boilers, the burning coal would rest on grates. But in a "fluidized bed boiler," crushed coal particles float inside the boiler, suspended on upward-blowing jets of air. The red-hot mass of floating coal — called the "bed" — would bubble and tumble around like boiling lava inside a volcano. Scientists call this being "fluidized." That's how the name "fluidized bed boiler" came about. 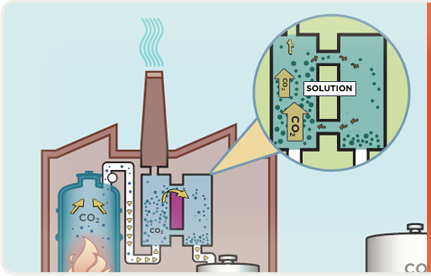 Why does a "fluidized bed boiler" burn coal cleaner? 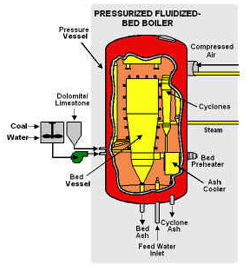 The second reason a fluidized bed boiler burns cleaner is that it burns "cooler." Now, cooler in this sense is still pretty hot — about 1400 degrees F. But older coal boilers operate at temperatures nearly twice that (almost 3000 degrees F). Remember NOx from the page before (> go back)? NOx forms when a fuel burns hot enough to break apart nitrogen molecules in the air and cause the nitrogen atoms to join with oxygen atoms. But 1400 degrees isn't hot enough for that to happen, so very little NOx forms in a fluidized bed boiler. The result is that a fluidized bed boiler can burn very dirty coal and remove 90% or more of the sulfur and nitrogen pollutants while the coal is burning. Fluidized bed boilers can also burn just about anything else — wood, ground-up railroad ties, even soggy coffee grounds. Today, fluidized bed boilers are operating or being built that are 10 to 20 times larger than the small unit built almost 20 years ago at Georgetown University. There are more than 300 of these boilers around this country and the world. The Clean Coal Technology Program helped test these boilers in Colorado, in Ohio and most recently, in Florida. A new type of fluidized bed boiler makes a major improvement in the basic system. It encases the entire boiler inside a large pressure vessel, much like the pressure cooker used in homes for canning fruits and vegetables — except the ones used in power plants are the size of a small house! Burning coal in a "pressurized fluidized bed boiler" produces a high-pressure stream of combustion gases that can spin a gas turbine to make electricity, then boil water for a steam turbine — two sources of electricity from the same fuel! 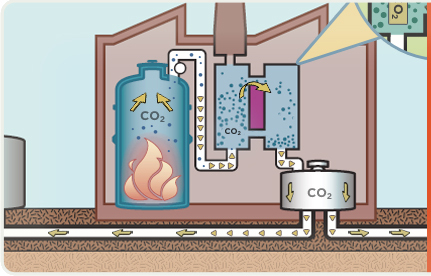 A "pressurized fluidized bed boiler" is a more efficient way to burn coal. In fact, future boilers using this system will be able to generate 50% more electricity from coal than a regular power plant from the same amount of coal. That's like getting 3 units of power when you used to get only 2. Because it uses less fuel to produce the same amount of power, a more efficient "pressurized fluidized bed boiler" will reduce the amount of carbon dioxide (a greenhouse gas) released from coal-burning power plants. 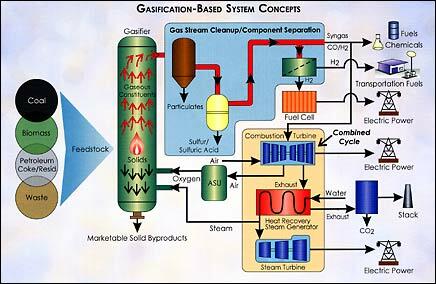 "Pressurized fluidized bed boilers" are one of the newest ways to burn coal cleanly. But there is another new way that doesn't actually burn the coal at all. The Cleanest Coal Technology - a Real Gas! Don't think of coal as a solid black rock. Think of it as a mass of atoms. Most of the atoms are carbon. A few are hydrogen. And there are some others, like sulfur and nitrogen, mixed in. Chemists can take this mass of atoms, break it apart, and make new substances - like gas! How do you break apart the atoms of coal? You may think it would take a sledgehammer, but actually all it takes is water and heat. Heat coal hot enough inside a big metal vessel, blast it with steam (the water), and it breaks apart. Into what? The carbon atoms join with oxygen that is in the air (or pure oxygen can be injected into the vessel). The hydrogen atoms join with each other. The result is a mixture of carbon monoxide and hydrogen - a gas. Now, what do you do with the gas? You can burn it and uses the hot combustion gases to spin a gas turbine to generate electricity. The exhaust gases coming out of the gas turbine are hot enough to boil water to make steam that can spin another type of turbine to generate even more electricity. But why go to all the trouble to turn the coal into gas if all you are going to do is burn it? 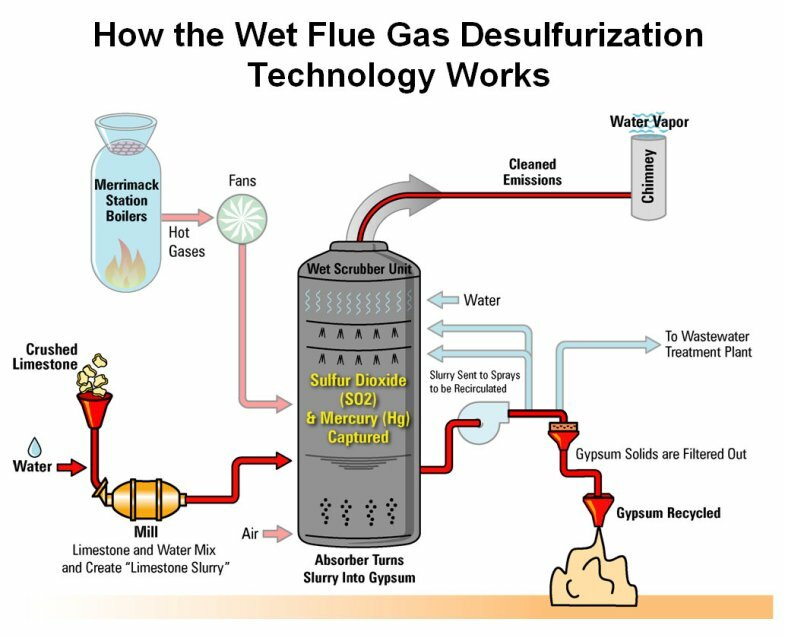 A major reason is that the impurities in coal - like sulfur, nitrogen and many other trace elements - can be almost entirely filtered out when coal is changed into a gas (a process called gasification). In fact, scientists have ways to remove 99.9% of the sulfur and small dirt particles from the coal gas. 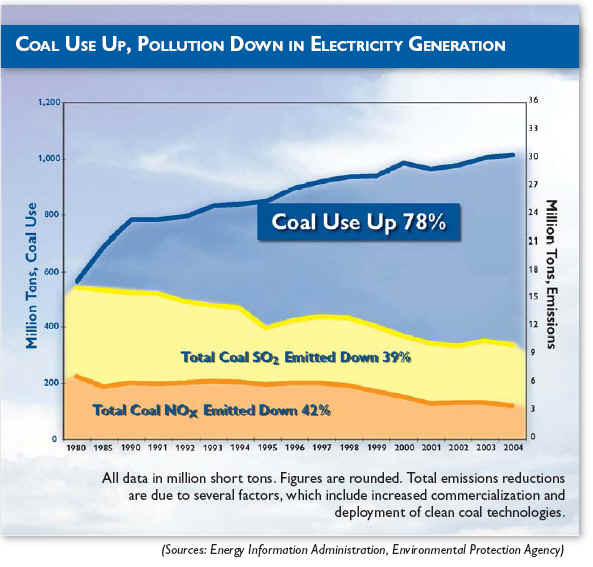 Gasifying coal is one of the best ways to clean pollutants out of coal. Another reason is that the coal gases - carbon monoxide and hydrogen - don't have to be burned. They can also be used as valuable chemicals. Scientists have developed chemical reactions that turn carbon monoxide and hydrogen into everything from liquid fuels for cars and trucks to plastic toothbrushes! Today, outside of Tampa, Florida (near the town of Lakeland), and in West Terre Haute, Indiana, there are power plants generating electricity by gasifying coal, rather than burning it. Coal gasification could be one of the most promising ways to use coal in the future to generate electricity and other valuable products. Yet, it is only one of an entirely new family of energy processes called "Clean Coal Technologies" - technologies that can make fossil fuels future fuels. When coal burns, it creates the greenhouse gas carbon dioxide (CO2), as well as other air emissions. Emissions exit the boiler as "flue gas". CO2 in the flue gas reacts with chemicals to remove most of it. 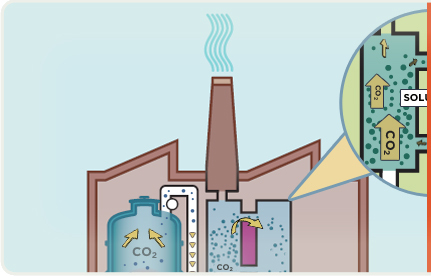 Flue gas that has been stripped of CO2 is released into the atmosphere through a stack (chimney). 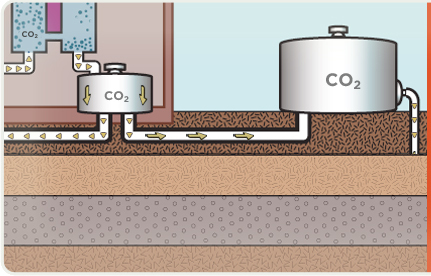 Captured CO2 is compressed, dewatered and transported via pipeline to a geologic storage site. 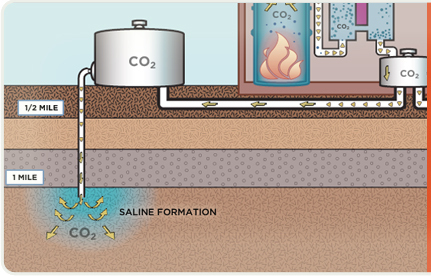 Captured CO2 is pumped into saline formations a mile or more below the Earth’s surface where it can be safely stored. 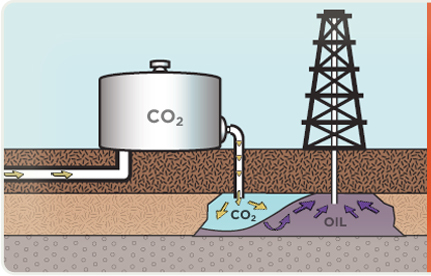 Sometimes captured CO2 can also be used to increase the flow of oil from an otherwise depleted reserve, where the CO2 will eventually be stored at least 2,500 feet below the surface. We need it for our energy security. It is America’s largest domestic energy resource — enough to last 250 years at current rates of use. It is a versatile energy resource that can be used in solid, liquid, or gaseous form. 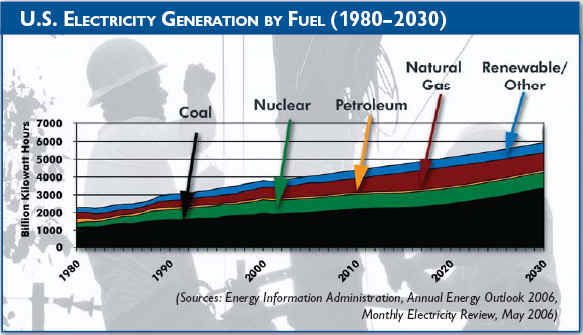 It has traditionally been the largest single source of U.S. electricity generation, currently providing more than 50 percent of the total, and will continue to be the primary generator of America’s electric power for years to come. It can be used cleanly and affordably to drive our economic prosperity. CLEAN COAL TECHNOLOGY . . .